THOUSAND OAKS, Calif., Sept. 17, 2018 /PRNewswire/ -- Amgen (NASDAQ:AMGN), Novartis and Banner Alzheimer's Institute (BAI), in association with Alzheimer's Disease International (ADI), today announced results from the largest global survey to date investigating perceptions of Alzheimer's disease. Findings show that most adults (62 percent) are worried they may develop Alzheimer's, while nearly the same proportion believe it is likely a cure will be developed in their lifetime (60 percent).1 This World Alzheimer's Month, Amgen, Novartis, BAI and ADI are raising awareness about how volunteers can take part in clinical studies to benefit Alzheimer's research, potentially themselves and future generations. 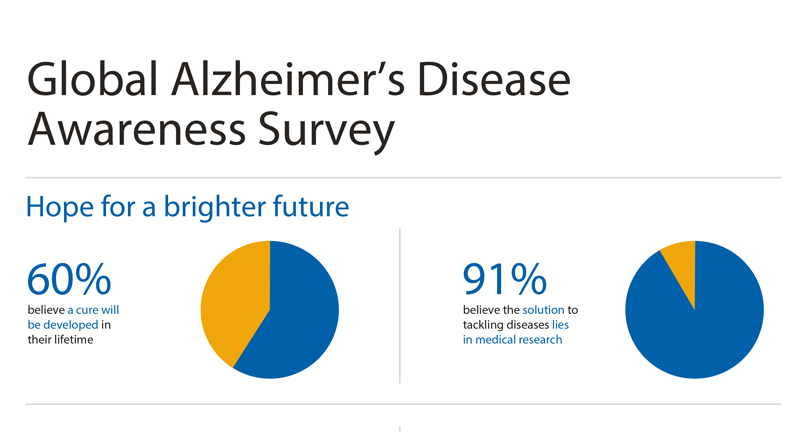 To view the Multimedia News Release, go to: https://www.multivu.com/players/English/8004557-amgen-global-alzheimers-disease-awareness-survey/. "At present, there is no cure and limited treatment options for Alzheimer's, but this survey clearly shows that people are willing to participate in research to help treat and to hopefully find a cure," said Paola Barbarino, chief executive officer at ADI. "We need to demystify and remove awareness barriers to participation in medical research, making all suitable candidates aware of how they can get involved." Worldwide, more than 400 clinical studies are recruiting in Alzheimer's.3 However, slow enrollment is a costly and common obstacle that undermines medical research.4 There is a need for more people to volunteer to advance scientific discovery. 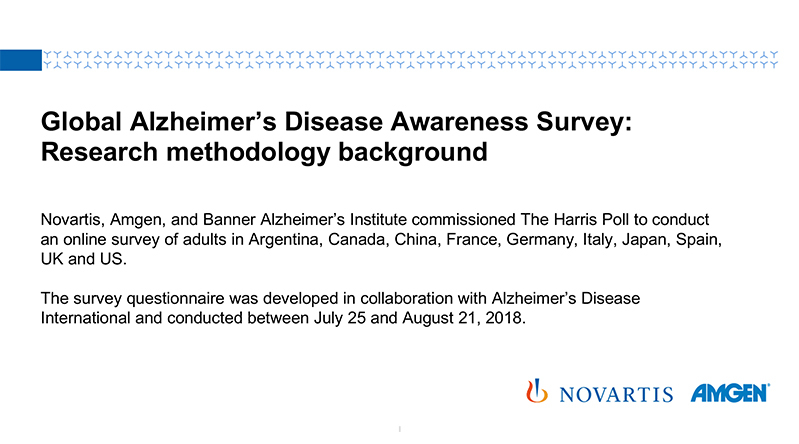 "The results from this survey clearly demonstrate the need to raise awareness about clinical studies globally," said Pierre N. Tariot, M.D., director of BAI and co-director of the Alzheimer's Prevention Initiative (API). "Aside from funding, the greatest challenge in finding a way to treat, slow, or prevent Alzheimer's is the recruitment and retention of study participants. Scientists are making great progress in the fight against this disease, but an estimated 80 percent of studies fail to meet recruitment goals on time, which delays critically important research." September 2018 marks the 7th World Alzheimer's Month and represents a chance for people to raise awareness, fundraise and find out more about how they can participate in research. 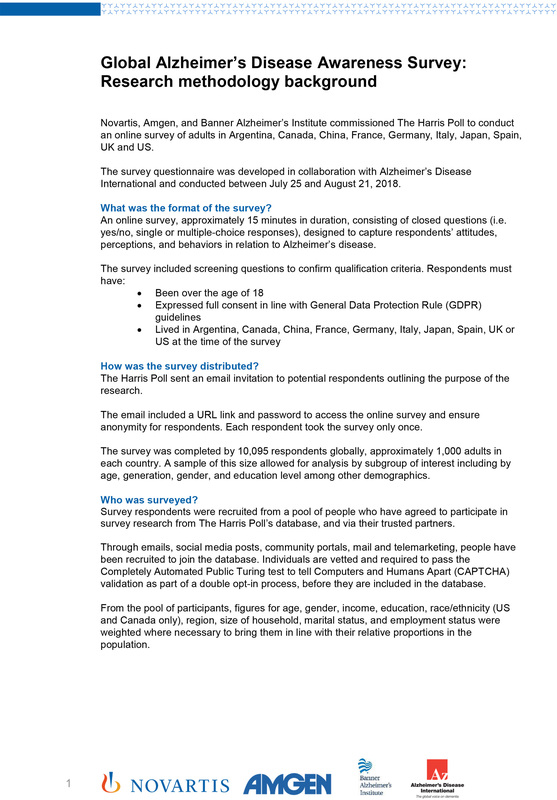 In addition to the global survey results, ADI will also launch their World Alzheimer Report 2018 entitled The state of the art of dementia research: new frontiers, which looks at the hopes and aspirations, the barriers and enablers to improving dementia research globally. More information on the report can be found here https://www.alz.co.uk/worldreport2018. "Amgen, along with Novartis, Banner Alzheimer's Institute and Alzheimer's Disease International, is committed to raising awareness of how to enroll in Alzheimer's research to empower patients and healthy volunteers," said David M. Reese, M.D., executive vice president of Research and Development at Amgen. "Alzheimer's research often does not get the attention and support it deserves. These survey results illustrate the significant public worry about developing Alzheimer's and reinforce the need to raise greater awareness of how people can participate in clinical studies to contribute to Alzheimer's research." Amgen is currently enrolling volunteers for clinical trials in Alzheimer's research. Additional information about clinical trials is widely available online and from local patient advocacy groups. Details of Alzheimer's clinical studies can be found on the ADI website www.alz.co.uk/clinical-trials/find and the Alzheimer's Prevention Registry www.endALZnow.org/. Studies can also be found within the ClinicalTrials.gov study database, https://clinicaltrials.gov, under the search criteria 'Recruiting' and 'Alzheimer Disease'. The survey was conducted online by The Harris Poll on behalf of Amgen, Novartis and BAI, among 10,095 adults 18+ living in Argentina, Canada, China, France, Germany, Italy, Japan, Spain, UK and the U.S. The survey was conducted between July 25 and Aug. 21, 2018. Figures for age by gender, income, education, race/ethnicity (Canada and U.S. only), region, size of household, marital status, and employment status were weighted where necessary to bring them into line with their actual proportions in the population. In August 2015, Novartis entered into a global collaboration with Amgen to develop and commercialize pioneering treatments in the field of migraine and Alzheimer's disease. 1. Data on file. August 2018. 2. Dementia fact sheet December 2017; World Health Organisation: http://www.who.int/news-room/fact-sheets/detail/dementia Accessed August 2018. 3. ClinicalTrials.gov: //clinicaltrials.gov/ct2/results?recrs=ab&cond=Alzheimer+Disease&term=&cntry=&state=&city=&dist=. Accessed August 2018.